Need some clever ways to hide problem areas of your home and keep it looking fresh all the time? Here are 10 tips for hiding eyesores in your home. Sometimes we may find that if we stop and look around our home, it just isn’t up to the standard we may like it to be. The good news is we have some tips on how you can hide those problems and keep your home looking fresh all the time. These creative ideas will help you to hide home eyesores. So you have a tidy and organized home. But there are probably at least one, if not a few, things that are still bugging you. Today we’re going to address the most common home eyesores. Chances are, you aren’t the only person dealing with some of them, and there are some creative ideas to hide them. What is a Home Eyesore? Home eyesores include anything around your house that distracts from your peaceful clean home decor. Maybe you have a hole in the wall, or your furniture doesn’t quite match. Let’s take a closer look at the 10 most common ones. So here’s how to hide home eyesores and make your house look picture perfect. Trying to scrub a stain off the wall can be a lot of work. You can always paint over it. But if you want a quick solution to hide a wall stain, hang art on top of it. This will not only hide that eyesore, but it will also add style to your home based on what you choose to hang! Stubborn stains from children or pets? Try rearranging your furniture to cover it up! Moving furniture around really helps refresh a room too, making it feel like a whole new space. If there is a large stain on your carpet, cover it up with a new rug. Layering rugs on carpet adds depth and more color to the room too. Another common home eyesore is mismatched furniture. This is easy to solve. Just draw attention elsewhere in the room. Hang a large decorative piece, use colorful drapes, paint an accent wall, whatever you want! Drawing attention away can make your furniture visually fade into the background. Do you have a small dent or hole in your wall? Damage marks can be treated similarly to wall stains by simply hanging something over them. Keep in mind for more significant damage, such as a larger hole that goes through the drywall, this should not be a permanent solution. Make sure you fix major problems. Having your router out in the open can be an eyesore, but it doesn’t have to be visible to work. Try taking a decorative box, cutting a hole in the back to run the wires in, and putting your router in that instead. Check your favorite department store for decorative bottles or dispensers for your soaps, shampoos, and lotions. They come in all shapes, sizes, and styles so you’ll have no problem finding something that fits your needs. You could even go one step further and get a matching set for your whole house! Nobody likes to see a rat’s nest of cables. This eyesore is much easier to deal with than it may seem. If you bundle them from the source you’ll only have one big cable to deal with, and you could easily wrap it to match the color of your desk or wall, making it virtually disappear from sight! Take some contact paper or spare crown molding and decorate the front edge of any wire racks you have. This will not only give them a pop of style, but it’ll make your home feel so much more elegant with such a small detail. If you have exposed pipes on your walls, such as in a laundry room or basement, try covering them up with a false wall. Your false wall can be anything you want, such as pegboard for utility or shiplap for that rustic style. Does the sight of electrical outlets turn you off? You can hide electrical outlets in a number of creative ways. In fact, this post has quite a few fun ones. Create a trap door that matches the tile or paint colors. Give the door hinges so it can open when you need to use the outlets. You could also just relocate them entirely. Move them under the cabinets, or even the floor, so they are easier to hide. There you have it! Learning how to hide home eyesores is simple once you start thinking creatively. Hide any nasty eyesore we haven’t mentioned with decorations. Things like a dog crate or wastebasket aren’t typically things we think about dressing up, but if the sight of it bothers you, give it a try. Don’t be afraid to get creative! Get your home tidied up and visually stunning, even in those problem areas with these ideas on hiding eyesores. You may also want to learn how to fake a clean house. Keep in mind, what’s considered an eyesore is different for every person and every home. What works for you might not work for someone else, but these tips are a great place to start! 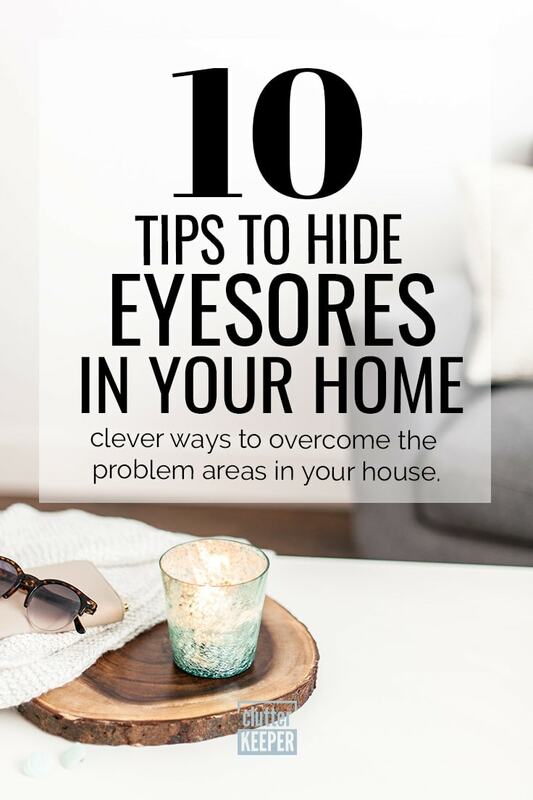 Now that you know how to hide home eyesores, keep up the good work. 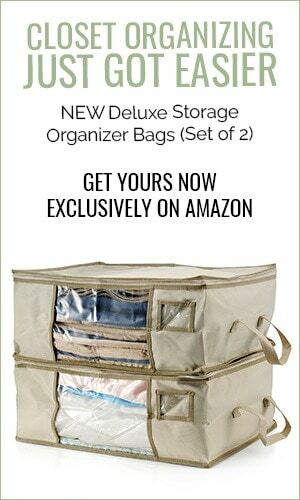 Here are a few more home organization articles with helpful tools for every room. 10 Creative Ways to Hide Cord Clutter – Finally solve all those cords that drive you crazy at your desk. Top 10 Places You’ll Find Clutter in Your Home – Which of these do you relate to most? 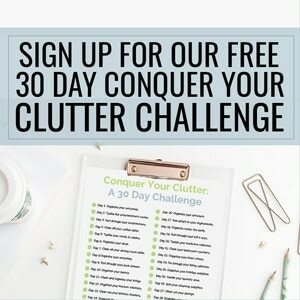 5 Ways To Start Organizing When You Are Too Busy – Banish that “too busy” excuse. 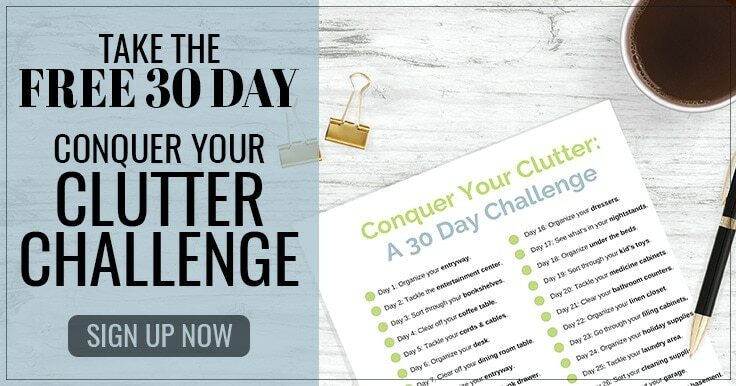 Start getting organized today.